This is the seventh volume in the Dark Screams anthology series and I believe I’ve read them all, so far. As with most anthologies, there were some strong showings here and some that didn’t quite stand up to the others. Like the previous edition, this volume features six short stories – or more accurately, five short stories and one novelette/novella. Robert McCammon’s “Lizardman” has a great premise and tremendous setting for a horror story, but it just never connected with me. “A Monster Comes to Ashdown Forest” by James Renner was one of the most original stories, and had me thoroughly invested in the story and frightened out of my wits. I suspected what was coming at the end but I was still on edge all the way through. In this story Christopher Robin, now an old man, revisits the Hundred Acre Wood, which isn’t as serene as the fairy tales present it. “Furtherest” by Kaaron Warren is a short in which a young girl dares the other kids at the beach to go out past the dunes where some boys died years ago. This story plays on the psychological horror, which I generally enjoy. There was nothing wrong with the story but it wasn’t memorable at all. Once you turn the last page it’s forgotten. “West of Matamoros, North of Hell” is by Brian Hodge in which a photo shoot in Mexico gets creepy. I enjoyed this dark story. The cultural differences (from what I am typically familiar with) really help play up the dark attributes of this story. Bill Schweigart’s “The Expedition” was another story that I just couldn’t connect with. Here a German office hopes to bring glory to the Fatherland with his expedition through the Carpathian mountains but there is something following them. It could be that I don’t really get in to Nazi/horror stories. “Snow Showers” by Mick Garris was the longest work in the collection and might have been a better tale had it been shorter by half. A schoolteacher’s affair turns into a spooky, long-running visitation. As always, there are hits and misses here which puts my rating for the book right in the middle. I’ve come to wonder if I lean more to one or the other of the editors in terms of what I like. Looking for a good book? 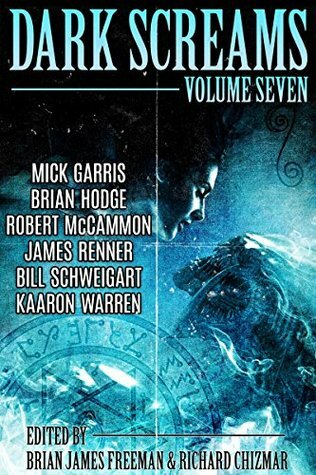 Dark Screams Volume Seven is a collection of dark(ish) stories that are overall pretty average – though those above average are well worth reading.